A major food feature in this coming Sunday’s New York Times magazine (12/22/13) is an enthusiastic piece by Mark Bittman on the pleasures of pressure cooking. Mark came over to my Manhattan kitchen about six weeks ago and we cooked up a storm. You’ll see what it all looked like in the accompanying videos and you’ll have four recipes adapted from Pressure Perfect: Beef Short Ribs, Lamb Meatballs in Greek Inspired Tomato Sauce, Porcini Risotto, and Black Bean Soup with Chorizo. Feel free to comment below the article to increase the enthusiastic response. And please e-mail the article to friends so we can spread the word about the joys of pressure cooking. Happy cooking and happy holidays to all! After seeing the video on the NYTimes site, I have suddenly become interested in PC cooking…but am not sure what size/capacity cooker to consider. (most of the time, I am cooking for 4) What size cooker do your recipes work best in? A 6-quart is great, but choose an 8-quart if you want to make larger quantities of soup and broth. Happy cooking! This is really awesome, Lorna! Congratulations of the highest degree are in order! Well done…In addition to the cooking visuals, your discussions with Mark were enlightening. Even though I don’t cook meat, the techniques you shared show us all how wonderful an addition a pressure cooker is to any home chef’s kitchen. 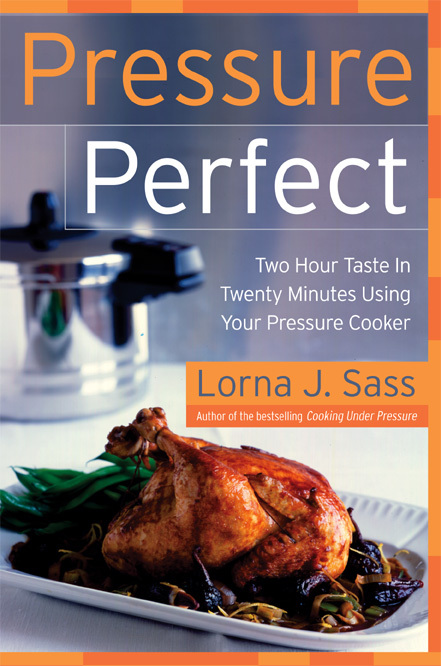 I have waited so long for a good pressure cooker cook book, I am so excited your recipes are so collectible and now they are in one book. I never thought I would use a pressure cooker but my husband loves the efficiency and speed a great meal can be prepared with great taste. Loving the title – will take a look at it. I just came across this video after rediscovering using the pressure cooker as a very effective way to cook in the summers heat. Thanks for all the wonderful cookbooks you have written!